Way back in at the beginning of 2014 I wrote about remote imaging. I know, not very analogue, but my reasoning is that using robotic telescopes wouldn’t cost me valuable observing time under clear night skies. Disclaimer: the views expressed here are those of a visual observer… there are many talented astrophotographers out there, but I’m not one. Whilst it’s possible to get surprisingly good astronomical images by sticking your phone up against the eye piece there are limits. If you want to push them things can get very expensive, very quickly. The mount is typically the first upgrade. If you can’t align the mount, rely on it to track smoothly, and be rock solid whilst doing it, you’re likely to get disappointing results. Then there’s the camera. Deep-sky images of smaller, fainter objects require a CCD sensor because they’re more sensitive than those in your DSLR, and it won’t hurt if it’s cooled to reduce noise. Add a guide scope and camera, and then you can worry about the imaging telescope itself. See, expensive, but it’s not the expense that puts me off. The practicalities of suburban life. I’ve got a small garden that I have to move around to find a place where I can see my target. Finding a place for a permanent observatory isn’t an option. Without one setting up an imaging rig is not for the fainthearted under poor british skies. I don’t want to spend half the evening setting up just for the rain to arrive. Besides, I wouldn’t be able to resist just popping an eye piece in the focuser and then the night would be over for imaging. So for those occasional deep-sky images and photometry – more on that another time – I’ve signed up to try the remote robotic telescopes of the iTelescope network via their free demo account. Most professional observatories are used remotely and are essentially robotic (no people involved). They’re often in ridiculously remote locations to get the best observing conditions, and the scientists that use them would prefer not to be there for various reasons. The entire iTelescope system is controlled via the Internet. Nothing more than an Internet browser is required to remote control the telescopes. but it provides all the same output data that you’d get from the same setup in your garden. It’s the advanced imaging experience without the hands-on hassle. Is it proper astrophotography though? I’d say yes… and no. Planning your imaging session is still vital: where is the target in relation to the Moon; when is the best time to start the run; how many subframes and filters, and how long should each exposure be? And post processing the raw data from the downloaded fits files with your favourite software is the same. But if you feel astrophotographers need to know how to get the best out of the physical equipment, obviously this type of service will fall short. I think it provides great opportunities, but it won’t make you a skilled astrophotographer. As I’ve explained, I don’t want the hassle of complex equipment, and I’d rather spend more time at the eye piece. The opportunity to image objects during the day or that are only visible from the southern hemisphere – these robotic sites are in the USA, Europe and Australia – is a great attraction too. The free demo only allows me access to two telescopes that’ll take a single colour image of one of a selected range of objects. 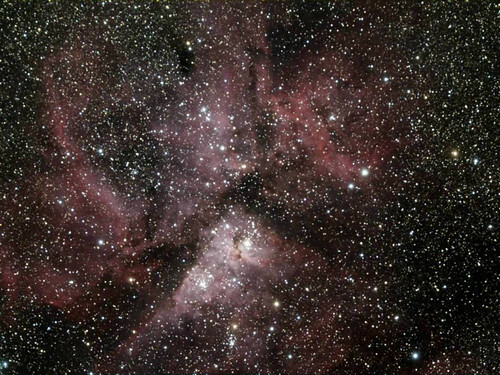 I chose to use the telescope in Siding Spring, Australia and try imaging the eta Carinae nebula (NGC3372) because you can’t do that from the UK. One Click imaging is as simple as it sounds: log on to the telescope in the browser, find NGC3372 in the list and click the button next to it. This runs a script to align the scope and take a 10 minute exposure. The result is emailed to you as a relatively low resolution jpeg file like this one. Personally I don’t think that’s too bad considering the limitations of the demo account. It’s certainly tempting to upgrade for access other telescopes and more sophisticated imaging options. I’m also interested in the possibility to link to the AAVSO VPhot photometry tools for variable stars, but that’s another story.